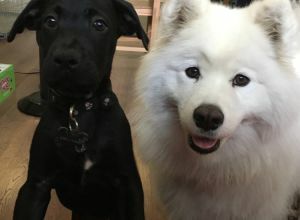 Maeby & Ben | Samoyed in Montréal. Sorry, Maeby & Ben is unavailable. Last login 7 months ago. Maeby is a 4 year old samoyed. She is friendly, happy and overall just the best. She loves both dogs and humans but hates cats. She loves to meet new people and make new friends. Ben (Benjamin) is a 1 year old boxer mix. He loves people and loves to go on walks. He still acts like a puppy and is very rambunctious. He is very energetic and easygoing. He is cool with people and other pets. P.s Amanda’s dog Ben...is seriously, absolutely charming from the first second you’ve met him he has already decided he’s excited to see you. Loves to pull on his leash as he’s very strong at his young age but so harmless and otherwise always approving of love and affection. Tip: watch out becuase he loves to pick up little branches to chew on or play with but they’re small enough he could choke on them! Will definitely be walking Ben and Maeby again when the weather is a little less cold for them to handle. Thanks Amanda! Only walked her for close to 1.3 hours and yet I can tell she’s the sweetest, most down to earth dog you’ll ever walk! You’ll fall in love with her right away, she’s comfortable with people pretty much instantaneously and always ready & happy to give a quick kiss on nose for reassurance that she’s in a good mood. Pleasure to meet her owner and Maeby’s little bro Ben too!